VVPAT- How does it work and why is it important? VVPAT stands for Voter Verifiable Paper Audit Trail. It is intended as an independent verification system for voting machines designed to allow voters to verify that their vote was cast correctly, to detect possible election fraud or malfunction, and to provide a means to audit the stored electronic results. In this article we shall have a look on this system in detail. Recently many opposition parties have been raising doubts over EVMs claiming that the EVMs can be hacked/tempered. The Election Commission has been dismissing all such claims and has also several times thrown an open challenge to hack EVMs. But still opposition parties are demanding that the paper ballot system should be reintroduced for greater transparency. That’s why Chief Election Commissioner has requested Union Law ministry for urgent release of funds to procure VVPAT machines for the 2019 elections. The use of VVPAT will enhance the transparency in election process and a voter’s confidence in the process will be strengthened. 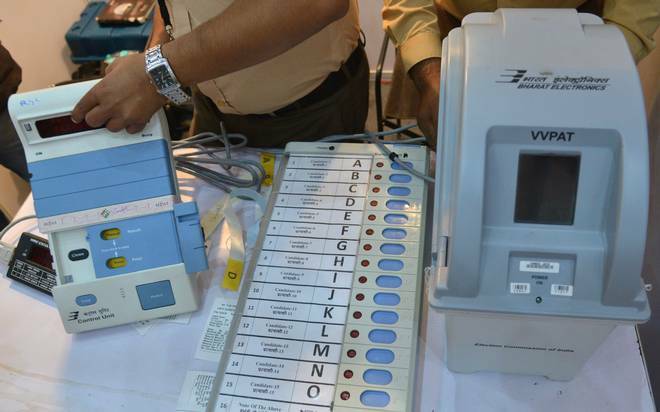 How does VVPAT system work? It is basically a printer attached to electronic voting machines. When a voter casts his vote, a paper slip is printed through VVPAT. It allows the voter to verify that his vote has gone to his desired choice only. After the voter views the slip, that slip will be dropped inside a sealed box linked to the EVM which can only be opened by authorised people. The biggest criticism is that in case of a discrepancy is found between the records in VVPAT and the records in EVM, which one would be considered to be legitimate? Critics also say that if an EVM can be hacked then VVPAT can also be hacked. Current VVPAT systems are not usable by some disabled voters. Currently VVPAT systems use thermal printers to print their paper ballot records. Critics say that ballot records printed on the thermal paper will fade with time. Also, heat applied to the paper before or after the election can destroy the printing. In the 2006 primary election in Cuyahoga County, Ohio, a study found that 9.6 percent of the VVPAT tapes were either destroyed, blank, illegible, missing, taped together or otherwise compromised. In one case the thermal paper was loaded into the printer backwards leaving a blank tape. thRadical :Short notes for Competitive exams: VVPAT- How does it work and why is it important?